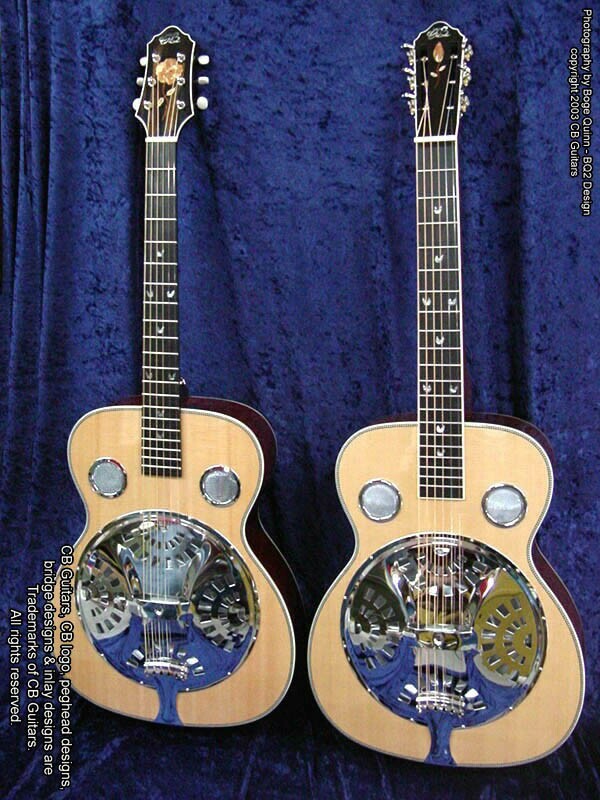 The CB-ROM (Resophonic Orchestra Model) was designed for the player who requires a guitar with unparalleled cutting ability, a guitar whose sound will be noticed in a band or jam setting of any size. Designed by Chris Bozung with input from James E. Wood, Nashville fingerstylist Gene Bush, and the late legendary resophonic guitarist Gene Wooten, the CB-ROM is not "just another resophonic guitar"; the CB-ROM represents a total re-thinking of the resophonic guitar concept. Beginning with the body of the guitar, Chris reasoned that the body size of the CB AuditoriOM would be perfectly-suited for the resophonic concept. The AuditoriOM soundboard is just the right size to direct the sound of the resonator cone, and the sound is further focused by the tighter waist and the depth of the OM body. 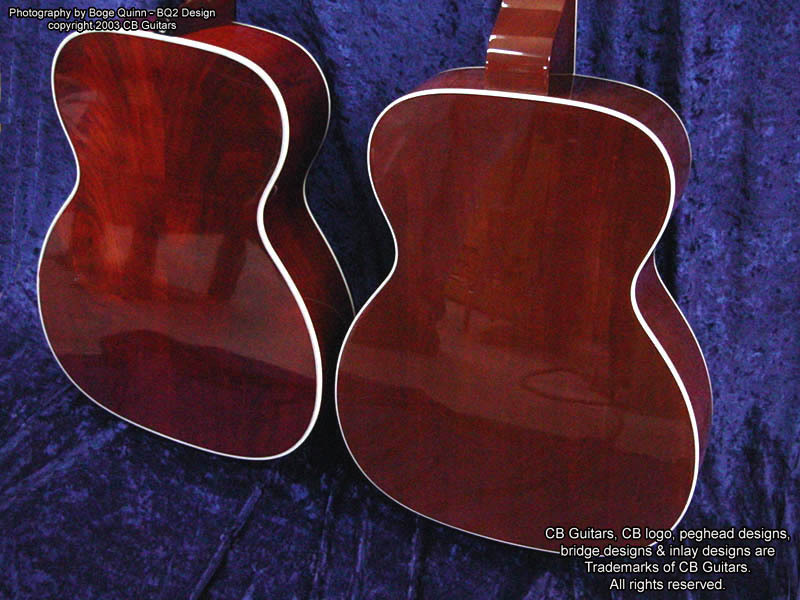 The top, back and sides of the CB-ROM, while slightly thicker than a standard CB AuditoriOM, are noticeably thinner than the woods used for even the finest vintage resophonics; also, the CB-ROM is made from all-solid woods rather than the plywoods used by many vintage and modern makers. 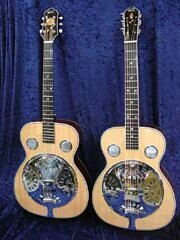 This allows the entire body of the CB-ROM to aid in producing sound, adding volume and more complex overtones to the traditional "metallic" resophonic guitar sound. The interior of the body is a model of acoustic innovation. While some modern makers have done away with the traditional sound well construction (as used in the finest vintage resophonics) in an attempt to open up the sound, Chris has taken a different approach. 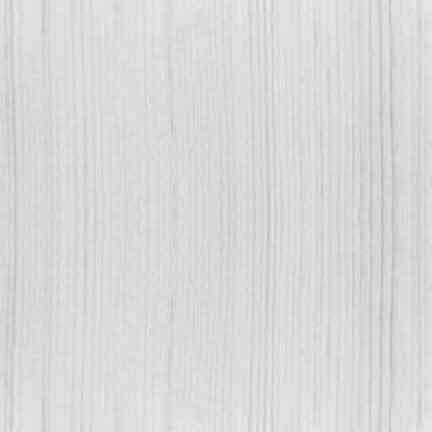 The CB-ROM features an innovative new open sound well design. Chris' proprietary open sound well design retains the focus of the traditional sound well, opens up the sound of the guitar, creates warmer overtones than can be typically found in a traditional resophonic guitar, and adds power and volume never before achieved in a resophonic guitar. Finally, rather than attach the neck with bolts as most modern resophonic guitar makers do, Chris uses the dovetail neck attachment found on the finest acoustic guitars. This makes for a more rigid neck-to-body attachment and adds sustain and volume to the sound, as well as adding strength to the instrument's design. 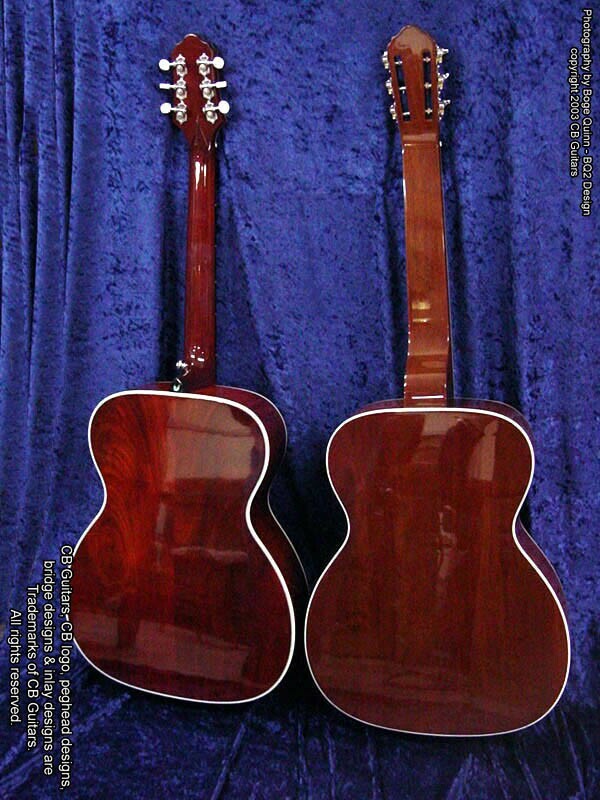 The CB-ROM (Resophonic Orchestra Model) is truly an innovative evolutionary step in resophonic guitar construction, with power, warmth, and focus of tone never before seen in a resophonic guitar. Recently, we had the opportunity to photograph the first CB-ROM, owned by Jimmy Wood, alongside the first Squareneck CB-ROM, owned by Tom Harrison. 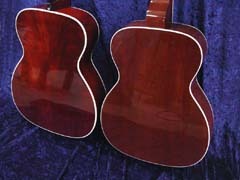 The guitars are identical in nearly every respect, excepting only the neck design. 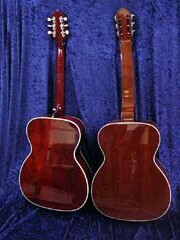 Tone woods used and internal construction features are identical. 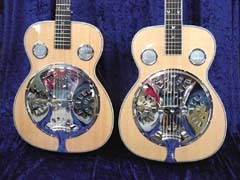 Click this link for sound samples of CB instruments. Send mail to webmaster@cbguitars.com with questions or comments about this web site.